Tekken 3 © 1996 Namco. The world's 19 toughest fighters enter The King of Iron Fist Tournament 3, in order to defeat Heihachi, and Ogre, who has taken the souls of many of the world's greatest fighters to adopt its own fighting style. Every character has his own ambition of winning the tournament. A fully 3-D game with one on one concept of fighting. 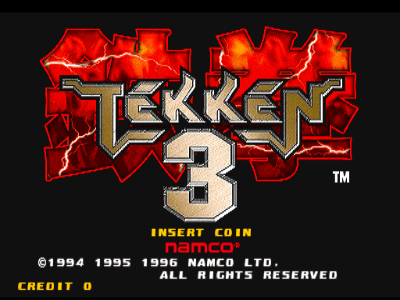 Tekken 3 was released in March 1997 (even if the titlescreen says 1996). The title of this game translates from Japanese as 'Iron Fist 3'. This is the first Tekken game which has 3-D backgrounds. 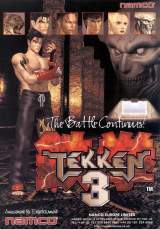 Namco's Tekken 3 production team used one of the most advanced motion capture apparatus and facilities at its time for the highly life-like movements, moves, actions and reactions of the 3-D characters. They also used some of the very famous and active personalities of different martial arts styles from all over the world, like, for Eddy Gordo's Capoeira style of fight they got the services of Master Marcelo Pereira of 'Capoeira Mandinga'. And for Hwoarang's Taekwondo style of fight they got the services of Hwang Su-Il of 'Japan International Taekon-do Federation, and several other martial arts institutes. Namco's production team motion captured each and every move to create such an in depth game, that was also one of the most higly anticipated fighting game for the last few years. 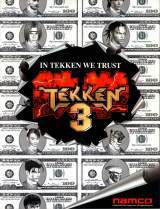 After Tekken 3, its followers like Tekken Tag, Tekken 4 and Tekken 5 got more and more depth, life-like impression, and the element of giving more fun (and addictiveness to its players). The word Tournament on the 'You are the Champion!' background is mis-spelled in the Japanese version as 'Tounament'. Most of the characters like Jin, Law, Julia are the children of the characters from the first Tekken games. The Lei Wulong music theme was certainly inspired by East 17's song: Steam (1994). In the Sound FX there is the announcer voice for Jun Kazama, Kazuya Mishima and Sake meaning these characters could have been in the game but weren't added to the final version. There are 21 different characters, but Anna, Tiger and Panda play identical to Nina, Eddy and Kuma respectively. In total, excluding Anna, Tiger, Panda and Mokujin, there are 17 characters with different moves. 1) According to the story Jun gets killed by Ogre (the god of fight). So if they would've put her they couldn't put Jin in the game as he probably looks of the same age of his mother. That doesn't apply to TekkenTag which has both Jin and his mother Jun, because TekkenTag does not have any storyline and the idea is to put all the characters from previous games (some of them were even dead). A cameo of this game seen is in the 2000 movie 'Dude, Where's My Car?'. 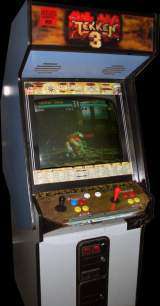 A "Tekken 3" cabinet can be briefly shown in the arcade scene. Wonder Spirits released a limited-edition soundtrack album for this game (Tekken 3 arcade soundtrack 001 ex - WSCAX-10001) on 18/07/1997. When a Time Release character is about to become selectable the vs. screen before a demo fight will say "Coming Soon" and display a picture of the hidden character. * Play as Anna Williams : Highlight Nina on the character selection screen and press Start. Anna plays identical to Nina. Anna is only available after Bryan is unlocked from Time Release. * Play as Tiger : Highlight Eddy at the character selection screen and press the Start button. Tiger plays identical to Eddy. This option is only available after Ogre 2 (aka True Ogre) is unlocked from Time Release. * Special Outfits : There are three characters that can have an additional outfit by pressing Start to select them instead of a punch or kick button, these are: Jin, Law and Xiaoyu. Law's third outfit is selectable from the start but Jin and Xiaoyu's school outfits can only be selected after Mokujin is unlocked from Time Release. * Fight Jin on Stage 9 : If you start a game with Heihachi you will fight Jin on Stage 9 instead, regardless if you continue and choose another character. note : On the home version, Anna was redone as a separate character with different moves, which a few were recycled from Tekken 1 and 2 to differentiate from Nina. One such move is the 'Red Bomb', denoted f,f+1+2; the animation for the falling opponent is from Tekken 1. The transformed main boss, known more commonly as 'Ogre 2' (named simply as Ogre in the game itself), was renamed True Ogre in the PlayStation release. Sony PlayStation 2 (2005, "Tekken 5") : available in the arcade history mode, with all fighters in the arcade version unlocked.